ur systems send signals faster and more efficiently. Patented Crash & Smash Protection – With “Crash & Smash” detection technology, Alarm.com systems can still send signals to the central monitoring station should the panel suffer a direct attack. Breakthrough Image Sensor – Your customers get an instant look into their homes while away. Remote Control – Keep your customers connected to their homes and businesses with simple to use apps and web interfaces. Mobile Apps – Available for Android, Blackberry, iOS and Windows Phone, our full suite of native mobile apps make it easier for your customers to be in control, get alerts, manage energy and watch video no matter where they are. Real-Time Notifications – Your customers can set customizable rules defining when notifications should be sent – so they get the exact information they want, when they want it. Alarm.com’s technology deepens your connection with your home. Our Smart Home Security solutions include interactive security, energy management, video monitoring and home automation. 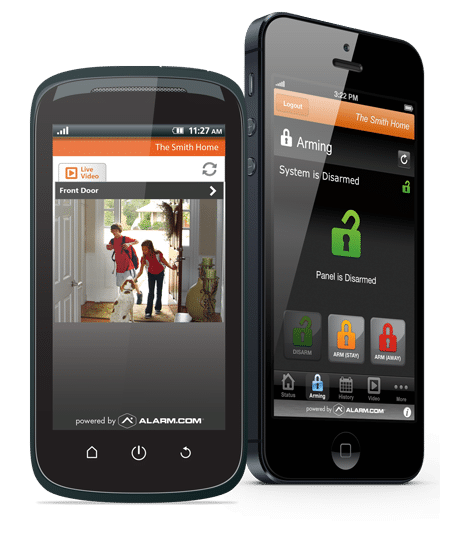 Installed and supported by a network of authorized dealers, Alarm.com powers an entire ecosystem of Smart Home devices, all controlled through a single mobile app.